Do you love finding new products that help keep your kids happy and healthy, but hate having to go to fancy health food stores to purchase them? Maybe you aren't a fan of some of the ingredients in your kids' daily supplements (or maybe you haven't yet realized some of the unnecessary ingredients use in leading kids' vitamin brands!). Zarbee's Naturals Multivitamins help you fill in the nutritional gaps safely and deliciously. These honey-sweetened vitamins are specially formulated for your kids. They are free of high fructose corn syrup, gelatin and gluten, and they have no artificial flavors, colors or sweeteners. That's the Zarbee's Difference - All Yum. No Yuck. 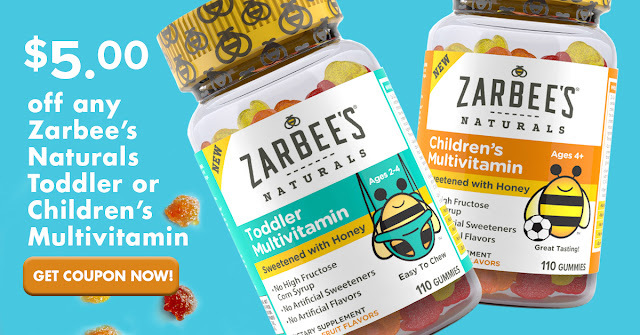 Even better, you can now purchase Zarbee's Naturals Multivitamins at Walmart! Click here or on the image above to get an amazing coupon for $5.00 off the Children's or Toddler varieties at Walmart. Talk about savings and convenience! But hurry, this coupon is only good for a limited time. There's a whole lot of good that goes into Zarbee's Naturals Multivitamins. They even have a "yummitment" guarantee! Ingredients you can feel good about, an awesome coupon, and available at Walmart? Sounds like an all-around win!